Old stone farmhouse, 250 sq. m., in a small hamlet, ideal for up to 10 persons with 5 double bedrooms with private bathroom with shower, a fenced swimming pool, panoramic terrace perfect for outdoor meals, barbecue, wood-burning oven, WiFi and parking. It’s an ideal property for those looking for a peaceful holiday, for families or groups for friends who love nature. The farmhouse was restructured in 2014, whilst maintaining typical Tuscan features such as wooden beams on the ceilings and and characteristic red bricks. The property is on three floors, with indoor staircases. The ground floor entrance leads to the large living area with arches and big windows, containing a dining room and living room with large table and sofas. Next to this is the professional kitchen, fully-equipped and complete with barbecue and wood-burning oven. A small bathroom rounds up this floor. You can access the first floor both from the indoor staircase and from the outdoor car park: here you will find 3 double bedrooms each with bathroom with shower. The second floor, accessible only from an indoor staircase, has 2 double bedrooms each with bathroom with shower, along with access to a balcony complete with outdoor armchairs and table for enjoying the great view of the valley. Borgo di Gebbia is in a small hamlet on a hill, at an altitude of 500m, between the Sienese and Arezzian countryside. The view overlooks large woods and fields. The property has WiFi, central heating, a baby bed, high chair and parking within the property. Each bedroom has a TV, a safe, mosquito screens and a small fridge. The price includes bathroom, bedroom and kitchen linen (changed weekly), internet, electricity, water and gas, high chair and baby bed. Upon request and to be paid for at the property are cookery courses, dinners, weddings, hired help and babysitter. The property is a perfect starting point for visiting the surrounding hamlets and for tasting the products made in the area. Civitella in Val di Chiana, a small nearby hamlet, is one of the best kept Longobardic fortresses. Arezzo and Florence are both easy to reach. 3.5 km Civitella val di Chiana (groceries, restaurant), 23 km Arezzo, 40 km Cortona and Rapolano Terme, 52 km Siena, 69 km Lake Trasimeno, 84 km Florence. 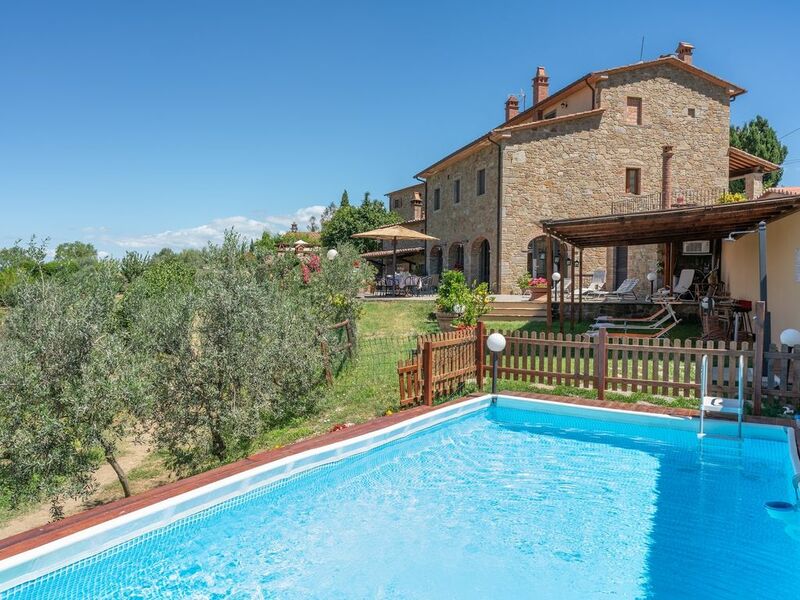 A wonderful villa in a beautiful setting, would recommend to anyone who wishes to wake up to the Tuscan hills and have all the comfort of a 5 star accommodation.